Direct to Garment Printing and Transfer Paper Printers are two top competitors for creating professional looking custom t-shirts. Potential buyers want to know how each system works, and what is the cost of DTG vs white toner technologies. And this has certainly been true for on the past couple of years with the creation of the DigitalHeat FX™ system and the arrival of white toner LED printers. 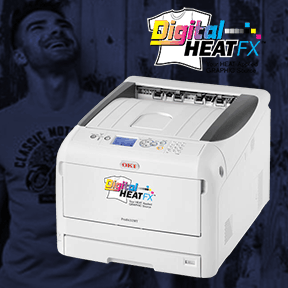 The DigitalHeat FX™ system is based on the popular white toner printer by Oki, the Okidata pro8432wt. Most color laser printers use CMYK toners to print. That’s a combination of Cyan, Yellow, Magenta, and Black toners. Of course, if you print on t-shirt transfer paper with this ink set (CMYK) you can get a great full-color t-shirt image too… as long as you’re printing on a white or light colored shirt. However, you run into a problem when you apply the t-shirt transfer paper using a NON-White Toner Printer. For instance, with a black cotton t-shirt, there is a big problem. The colors in the transfer combine with the black in the shirt. They come out DULL at best and look like a completely different color at worst. The solution is printing those images with a white background. That way, the red color you want is sitting on top of a layer of white. The “B” paper is where the glue is. So, you’ll lay the printed sheet on top of this one and heat press them together. This only takes about 30 seconds. Another option is a DTG printer. A direct to garment printer is a specially made inkjet printer made for T-Shirts and other Garments. We will discuss the features and the cost of dtg printing. Every ColDesi® direct to garment printer comes with a special software that allows you to “knock out” (remove) the background, so you have some flexibility to reduce your cost of dtg printing. With the M2 Direct to Garment Printer you can print on 1, 2 or 4 shirts at once, so in this step, you would load up the appropriate quantity. So then, what are the Pros and Cons of each? Which one is right for YOUR business? What is the cost of dtg vs other technologies? The Digital HeatFX System is in the $10,000 range depending on your options – This includes the white toner printer, a top of the line heat press that is strongly recommended, and a good initial supply of Laser EZ Peel paper. Find the details here. The M2 DTG Printer Starts at about $18,000– Direct to Garment printers start out more expensive than white toner systems, and you’ll also want a pretreatment machine discussed previously along with a heat press with a timer and automatic open so you don’t overheat your shirts. You can see more details here. The advantage here is for the Digital HeatFX System at a little over $10K less up front and a monthly savings of more than $220 if you lease. That’s fifteen cents in ink + about twenty cents in pretreatment. On a dark shirt, it will cost about $1.04. People will pay more for a design that looks proportional to an XXL or XL t-shirt than they will for a design for a small shirt. Imagine being at a family reunion next to the guy with a 3XL shirt who’s standing next to the girl with a SMALL shirt. And most low quantity custom printed t-shirts sold are black cotton. The great part about this is that it’s an easier sell. You don’t have to worry about picking or stocking blank shirts. It doesn’t take long, about 10 minutes, but if you don’t maintain your machine it will cost you thousands in repairs/replaced parts. You can print more stuff, like performance wear. This will get you more clients in more niche markets. Getting to say “yes” to potential customers more often is BIG.